Edmund Andrew was one of the founding men purchasing sections of Brooklyn Station. Born in New York October 31, 1821, Andrew came to Wisconsin in 1860 and settled in Footville. Three years later, a partnership began with E.A. Foot in the grain and produce business at Oregon (Foot & Andrew). After another three years (1870) Andrew bought the other half of the business and moved it to Brooklyn and formed a new partnership with his three sons, Homer, William Wallace and Howard George (E.J. Andrew & Sons). Following establishing branch warehouses at Footville and Oregon, Edmund retired and turned the entire business to his sons (Andrew Bros). In poor health for a number of years, Edmund died Sunday, February 19, 1893 (73 years of age). His funeral service was at Evansville with burial in Mt. Hope Cemetery, Brooklyn. His wife was the former Martha Bettinger. They had eight children; Homer, William Wallace, George Howard, Lottie, Bryon O., Gertrude, Eva and Harriet. In his later years, Homer was recognized as a progressive businessman. On the adoption of the Wisconsin Grain Inspection Law, he was appointed to the Board of Commissioners by the governor and chosen chairman by the commission. Harriet Emily was attending the Iroquois Theater in Chicago with a friend. Trapped in vast sheets of flames, her death was in 1903. She threw her coat around her friend, forgetting about her own protection and life. Graduated with honors, her desire was to be a nurse at the Park Avenue Private Hospital at Chicago. Her remains were brought by train to Brooklyn and interred in Mt. Hope. Coming to Brooklyn, the Edmund Andrew family purchased the hardware from Samuel Adams, the second place of business in Brooklyn (built in 1867). Eventually Edmund put his son, Bryon in charge. Later, Edmund sold to Joseph H. Wood. The hardware building was located on Hotel Street, the former hardware store location; now apartments. This building was a two-story structure which burned down (the second and present building is only one-story). The Andrew family lived over the hardware store. The first house the Andrew family lived later became the former Drug Store in 1879. 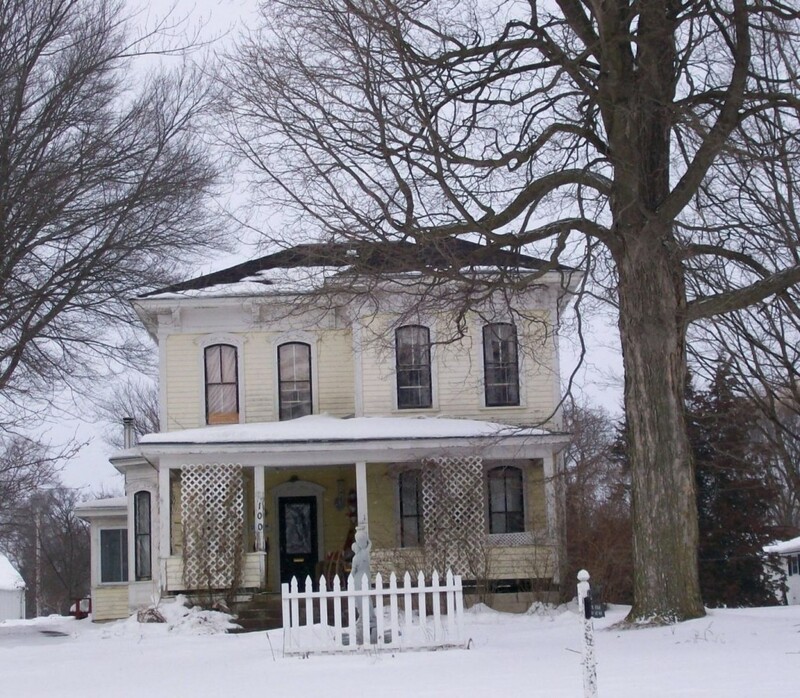 Buying 4 ½ acres from John H. Ward on West Main Street, near the railroad tracks, Edmund hired a Mr. Hankinson to built a house (1876-77). Living in Brooklyn, Hankinson constructed the structure, defined Italianate. Its Victorian interior and exterior has been kept to its original integrity. Today, the house is listed on the National Register of Historic Places. Surrounding the house today, the property consists of ¾ of an acre. Behind the house and carriage house property, was a stockyards and a windmill factory. Edmund’s son, George Howard (known as Howard) was the largest stockholder of the Lake City Tool Company at Madison. When their business was increasing, Howard offered more capital if they would move to Brooklyn and change the name to ‘Duplex Windmill Company.’ At that time, Howard had a cold storage business in Brooklyn. He got his ice from King and Baldwin Lakes. Never marrying, he directed his ice profits to investing in more stocks with the Lake City Tool Company. Gertrude married the pattern maker (John E. Geiger) at the Windmill Company. She told of her family living in a log cabin on the Ben Axtell farm. At that time there was no houses in Brooklyn. Gertrude remembers her mother brushing the snow off their beds several times. Whenever it snowed, it would come through the cracks of the roof. These rustic conditions prompted the move upstairs, over the hardware. In 1888, the Duplex’s products were pumping and power windmills, round wooden stock tanks, large and smaller grinders, washing machines, custom foundry, steel wheels for the windmills and woodwork. The need for expansion came in 1892, requiring more capital. 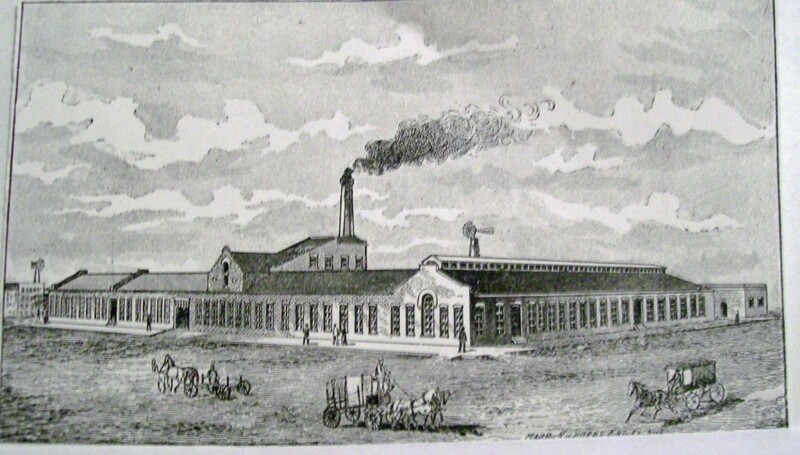 Hardware merchants Warren Howard and Don Osborn of Albany, Wisconsin invested in the factory using tobacco profits. Osborn became their business manager. Not having enough land to expand here, Osborne found room at South Superior to enlarge about 1892. This new location had excess to the rails and the big waters; allowing a broader range of shipping. They remained in business into the 1930’s. Retaining its original name, Duplex Windmill Company remained until 1895. Illustrating the firm’s efforts to diversify its product, the company changed their name to the Duplex Manufacturing Company. While at Brooklyn, the company was shipping their products throughout the Northern Great Plains and Upper Midwest by the rails. Sixty men were employed. During the 1885 village fire, the people decided to use the siren at the windmill in the early dark morning. Wood was thrown in furnace until the hot heat produced steam. The siren could be heard many miles, pleading for help. Hearing the loud siren, assistance came from neighboring villages. The Windmill Company was on Market Street, the future site for the Chair Factory. Wallace Andrew was the vice president at the South Superior plant. During this time, he was elected to the state assembly in 1900 and re-elected in 1904. Also at Brooklyn, Edmund and his sons had a warehouse near the rails. Hiram Capwell built Brooklyn’s first warehouse in 1864. Ownership changed to L. Parker, then to D.H. Glidden and then to Edmund. Andrew and his sons directed the building of Brooklyn’s first elevator in 1874. It was destroyed by fire 1882. Another elevator was erected with an immense capacity, being the largest between Chicago and St. Paul. The family operation handled about 150,000 bushels of grain and 200 train cars loaded with live stock annually, besides dealing with wool, poultry, game, butter, eggs and mill feed. Brooklyn was noted as an excellent market for all kinds of farm products. This business was later sold to J.H. Richards, E.H. Graves and Owen Roberts (Richards, Graves & Roberts). This elevator was removed in 1915. The railway company asked for more room along the rails.